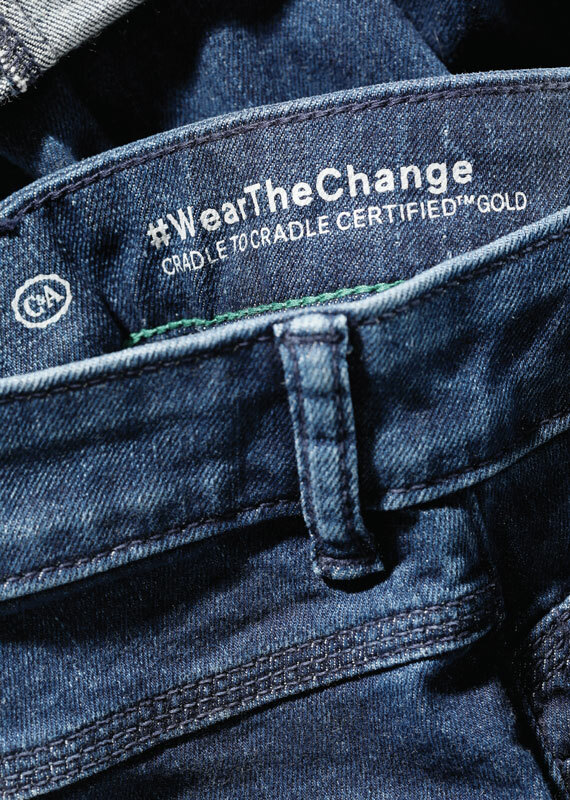 Fashion retailer C&A recently introduced the world’s first Cradle to Cradle Certified™ GOLD pair of jeans. C&A is leveraging a global network to create fashion with a positive impact. What does it take to make the world’s most sustainable denim jeans? And, more broadly, what does it mean to be sustainable and how is sustainability measured? The textile and apparel industry can have an enormous effect on the environment, as well as on the people that make and wear the final garments. With an increasing number of organizations and individuals developing innovative products, processes and ingredients, there are many members along the value chain not only minimizing harm but also doing more good. 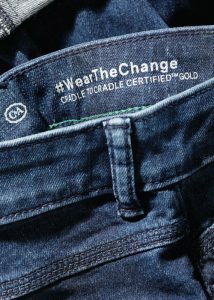 Recently, C&A, an international fashion retail clothing chain, released the world’s first Cradle to Cradle Certified™ GOLD denim jeans. Cradle to Cradle is a science-based quality certification that “acknowledges continuous improvement and innovation of products and processes towards the goal of being not just ‘less bad’ but also ‘more good’ for people and the planet.” The certification program is based on Charlottesville, Va.-based MBDC LLC’s Cradle to Cradle® framework and methodology. Certification is awarded at five levels — BASIC, BRONZE, SILVER, GOLD AND PLATINUM — with each level imposing a more rigorous set of requirements. The lowest score in any quality category establishes the product’s overall score. The jeans innovation posed both a material and design challenge that required designers to be open-minded and flexible in the way they utilize materials. The Cradle to Cradle Certified GOLD jeans were achieved through C&A’s close collaboration with Fashion for Good — an initiative connecting brands, producers, retailers, suppliers, non-profit organizations, innovators and funders to work together in a shared ambition to make the fashion industry a force for good — architect and sustainable development leader William McDonough, Cradle to Cradle Certified™ assessors MBDC, Spain-based consultancy service Eco Intelligent Growth S.L. (EIG), and the Cradle to Cradle Products Innovation Institute, a non-profit organization that administers the Cradle to Cradle Certified Product Standard. The release of C&A’s jeans came on the heels of the first ever Cradle to Cradle Certified GOLD, fully compostable T-shirt collection launched in 2017. The denim jeans provide an example of ways to collaborate within industry to split the materials into biological and technical nutrients to create a closed-loop system of design. Over the past year, C&A inspired collaboration among various manufacturers and suppliers to evaluate and improve the denim garment with regards to human and environmental health, recyclability and biodegradability, renewable energy use and carbon management, water stewardship and social fairness. MBDC provided the counsel of the jeans to C&A during the Cradle to Cradle certification process. In terms of material and chemical optimization, many denim garments are mixes of biological and technical nutrients — materials designed to flow optimally in nature’s nutrient cycles or circulate in a perpetual cycle of production, recovery and manufacture — which could be called a monstrous hybrid in Cradle to Cradle Design™ language. This presents a challenge — creating a garment that has the same performance as traditional models, but doing so in a way that is either 100-percent technical or 100-percent biological to allow them to return to their respective cycles at end of use. Another option, which was adopted for the jeans, is to make them easily separable so the biological and technical nutrients can return to their respective cycles. All the components in the jeans were made to be easily separable so the biological and technical nutrients can return to their respective cycles. Creating such a complex product presented several logistical challenges that came to be seen as opportunities. The diversity of the supply chain posed an opportunity as textile manufacturers rely on yarns, dyes and auxiliaries, each of which can have multiple suppliers, requiring cooperation from several key players beyond C&A and its mills in the certification process. MBDC worked to bring these companies together in collaborative advantage. By leveraging the strengths of different players, the team worked together to champion a sustainable and innovative product. EIG focused on working with European suppliers. EPEA Switzerland, another accredited Cradle to Cradle Certified assessor led by Albin Kälin, shared information for the fiber that provided the garment’s stretch. Typically, this stretchy material in textiles has been spandex, which is a copolymer known for its elasticity and comfort. These materials present considerable challenges from a Cradle to Cradle Design standpoint as they are petro-based, do not biodegrade and are not recyclable at end of use. However, EPEA Switzerland had previously collaborated with a company that produces a spandex-like fiber in a slightly different way. While not completely biodegradable, the material is compatible with biological systems. These spandex-like fibers can biodegrade, although at a considerably slower rate than the cotton, but can also later be recaptured for future use. When combined with the fiber, cotton is still compostable without having any negative impact on the microorganisms in the compost. In the future, this process can become more transparent and streamlined as spandex fiber manufacturers are encouraged to share their formulas, enabling more collaboration within the supply chain. The company that created this new fiber not only designed a unique way of making a stretchy fiber biocompatible, but also was open and transparent with its formulas. Because the ingredients and formulas of every element are known, MBDC could fully and thoroughly assess the garment for material health. C&A collaborated with multiple companies to develop the jeans and create a closed-loop system of design. Beyond material health, the denim jean garments embody The Five Goods — Good Materials, Good Economy, Good Energy, Good Water, Good Lives — described by McDonough. C&A, while embracing the entire Five Goods, particularly focused on Good Materials. Everyone involved had the goal of achieving GOLD level certification — particularly in the material health category. Unlike many other elements of manufacturing, materials and toxicity are not optimizable — once a toxic material is released, it is virtually impossible to get it back. From the beginning, the jeans were designed with chemicals and materials safe for humans and environmental systems. For Good Economy, also known as Circular Economy, despite combined biological and technical materials — the rivets are still metal and the zipper is still comprised of a synthetic material — the multiple components are easily separable so biological materials can return to biological systems and technical materials can return to technical systems. From the Good Energy perspective, everything is renewably powered at the mills, so each garment is manufactured using 100-percent renewable energy. Good Water is achieved through the mills’ closed-loop water system and keeping the dyeing process within the mills. In the modern textile industry, dyeing can be one of the most challenging processes for water quality, but utilizing a closed-loop water system means the water is being perpetually recycled. The only water that leaves the system does so through evaporation, so new water does need to be added occasionally, but there is no effluent and therefore no concern about contaminating local water systems or groundwater. The mills chosen were specifically selected for their emphasis on social fairness and paying above living wage to all their employees, which is required for certification in the fifth category of social fairness. A strong score for Good Lives also was achieved through C&A’s social programs, including global partnerships with Save the Children and C&A Foundation and its own Inspiring Women campaign. The partnership with Fashion For Good, an open-source initiative that supports the transformation of apparel culture toward a circular economy, also contributed to this aspect. During the certification process, Fashion for Good created a toolkit, Developing Cradle to Cradle Certified Jeans to accompany the garment’s release. The toolkit includes concrete solutions on how manufacturers can approach complex products and projects such as jeans to reach product certification at the GOLD level. Also accompanying the jeans’ launch was Fashion for Good’s Assessed Materials Almanac, which showcases materials and ingredients currently assessed for Cradle to Cradle Material Health available for use in the fashion industry. C&A, at the beginning of the project, made the decision to be as transparent as they could throughout the entire process so that others could learn from its work and draw inspiration from the journey. By being completely open, other manufacturers can connect with like-minded suppliers and potentially model their products after these garments. By launching the first fully Cradle to Cradle Certified denim jeans, C&A is not only empowering customers to choose popular apparel that is good for the world, but also encouraging other companies to follow their lead. This dedication to setting the fashion standard to one that puts human and environmental health first takes an inspiring step to increase economic, social and ecological benefits based on quality, not just quantity, to point the way to a thriving circular economy. To really change an industry, suppliers and manufacturers must be more transparent moving forward. That is really what C&A wanted to do with this project and that’s what Fashion for Good is all about — changing an entire industry. The hope for the project, among all the collaborators, is that it will become a model for, “it exists; therefore, it is possible.” C&A has created fast fashion items in a circular, Cradle to Cradle Design way, so almost anything should be possible. Editor’s Note: Jay Bolus is president of MBDC, advisors in material health, product design, and the Cradle to Cradle Design Framework.